The weather is beyond everyone’s control; acts of nature are not covered by the City. New Lisbon Municipal Electric & Water Dept. provides electric, water and sewer service for the City of New Lisbon. NLMEW purchases its electric power from Dairyland Cooperative but has the capability to generate electricity when area demand is high. NLMEW currently has 4-generation units capable of generating 8.2 megawatts. NLMEW also operates its own wastewater treatment plant with a capacity of 385,000 gallons per day. Billing: Bills are issued on the 1st of every month. They are due on the 20th of the month. Meters will be read monthly around the 25th of the month. Bills for service are rendered monthly on the first of the month. (A bill received on August 1st would cover service used end-June to end July). The bills become due and payable on the 20th of the month. A late payment charge of 1% per month will be added to bills not paid within 20 days of issuance. This late payment charge will be applied to the total unpaid balance for utility service, including unpaid late payment charges. The late payment charge is applicable to all customers. The utility customer may be given a written notice that the bill is overdue no sooner than 20 days after the bill is issued. Unless payment or satisfactory arrangement for payment is made within the next 10 days, service may be disconnected pursuant to Chapter PSC 113 & 185, Wis. Adm. Code. The Utility has partnered with Official Payments.com to take online payments at www.officialpayments.com or by phone at 1-800-272-9829. You will need the jurisdiction code 6780 and your account number. There is a nominal fee for this service. New Lisbon Municipal Electric & Water Department is a member of Focus on Energy. Focus on Energy works with eligible Wisconsin residents and businesses to install cost effective energy efficiency and renewable energy projects. Focus information, resources and incentives help to implement projects that otherwise would not be completed, or to complete projects sooner than scheduled. Its efforts help Wisconsin residents and businesses manage rising energy costs, promote in-state economic development, protect our environment and control the state’s growing demand for electricity and natural gas. Please check Focus on Energy out at www.focusonenergy.com/newlisbon or call them at 1-800-762-7077. The DPW is responsible for all the planning and management of all public works and utilities departments. The DPW will also coordinate all maintenance, construction projects, supervise all phases of snow & ice removal and maintenance of all city equipment, buildings and facilities. The Electric Department is responsible for the construction and maintenance of the City of New Lisbon electric distribution system. They also operate and maintain the powerhouse. The City’s Electric Utility presently has a contract with Dairyland Power Cooperative to supply electric to the City and we are required to generate electric periodically as part of the contract. 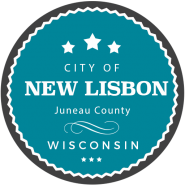 The Water & Sewer Department is responsible for the operation and maintenance of the wastewater treatment plant, collection system, water wells and all water mains within the City of New Lisbon. Water System Information – If you would like to know more about the information contained in this report, please contact Nick Wyss at (608) 562-3794.